Hey guys...Don't panic, this will not eat you or whatsoever. I am interested to share with you all about weird life and culture which maybe exist around us. Find out how the some other lives by doing the bizarre-but-true weird things from around the world. I will also present on the amazing phenomenon or things that amazed us. So come on, check this blog out!!! Look at this weird tradition, what do you think? 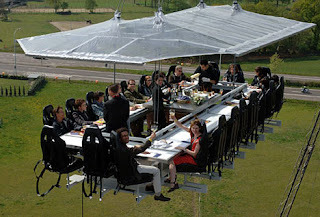 Imagine that you enjoy yourself a meal in the SKY...I had found these photos...but the location is limited in Paris and Brussels, while New York and Niagara Falls are on the agenda. 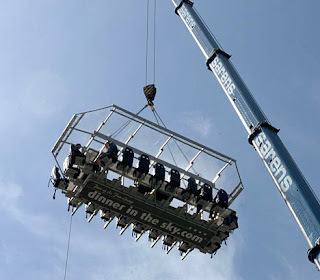 I can imagine how amazing it will be if the we enjoy our meal on the top of Niagara Falls. 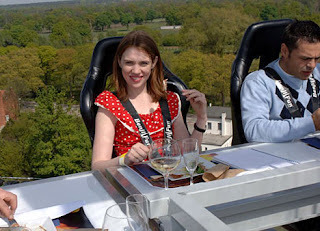 For your information, for a mere £10,000, they'll drive it over to Britain for you to host your own sky-high dinner party. It's amazing. Look at these pics, he Pingping from Inner Mongolia, China's autonomous region, the world's smallest man sits underneath Svetlana Pankratova from Russia, the Queen of Longest Legs, as they pose at Trafalgar Square in London, Tuesday, Sept. 16, 2008. Pingping, born with primordial dwarfism, holds the Guinness World Record for the smallest man at 74.61 cms (2 feet and 5.37 inches) and Pankratova holds the Guinness World Record for the longest leg of any woman at 132 cms (4 feet 4 inches) in length. I got these pics from the email and I like to share this amazing phenomenon with you, and I hope to see it myself. According to the info in the email, these pictures were captured on the Idaho/Washington border, the event lasted about 1 hour. It often appears as a greenish glow or sometimes a faint red, as if the sun was rising from an unusual direction. The common occurrence in the Poles. Watch out another post of aurora was http://weirdlifeandculture.blogspot.com/2008/04/amazing-phenomenon.html. 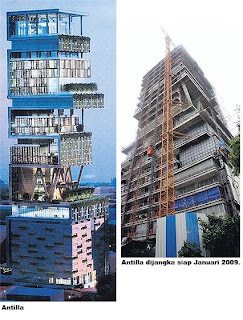 Mumbai - Mukesh Ambani, India's wealthiest resident, is building a 60-story vertical palace in Mumbai, complete with a helipad, swimming pool and space to park about 170 cars. Ambani, chairman of Reliance Industries and No. 14 on Forbes' list of the world's richest people--with a fortune we estimate at $20.1 billion--is reportedly spending $1 billion for the home in posh south Mumbai. "Like many families with the means to do so, the Ambanis wanted to build a custom home. They consulted with architecture firms Perkins + Will and Hirsch Bedner Associates, the designers behind the Mandarin Oriental, based in Dallas and Los Angeles, respectively," the report said. "Plans were then drawn up for what will be the world's largest and most expensive home: a 27-story skyscraper in downtown Mumbai with a cost nearing 2 billion dollars." According to Forbes, Mukesh, along with his wife Nita Ambani and three children, currently live in a 22-story Mumbai tower. 3 helipads on top. Mumbai corporation has not given permission for making this operational yet. the building but apparently that is not the case. All these cars will belong to Mukesh Ambani! Just in case you are interested, he drives a 5 crore Maybach now. - A floor exclusively for servicing these automobiles within the building. - The house will have a staff of 600 (sic) to do the maintenance activities. That gives a ratio of 1:100 for people living in the house and those who are paid to take care of it. The six lucky (?) ones are the man himself, his wife, his 3 children and his mother Kokilaben. The family will be moving in from their old home ‘Sea Wind’ which was a 14 floor building at Cuffe Parade. A 14 years old daughter at Kelantan, Malaysia shocked when a 6.5 cm long thread went out from her left knee. Before this, the daughter was suffering an itch body at least a year ago. She was sent to the hospital and hoped that the expert can let them know the caused of this weird thing happen. Make Money Here This is your opportunity to get money and in the same time, you can get idea on your health based on your answer about yourself and your lifestyle. No scams involved, no offers to complete, and no money spent. You can also find tons of relevant articles about all kinds of health related topics. Wellness360 is a website dedicated to health. Almost every click you make, will earn you points. Oh, and they frequently have double or triple points opportunities. The points then translate into cash and you can cash out after your earn $25. And, at anytime, you can even see how much cash you actually have. So you can sign up for free here.